Book a Fitting and come in and I will build a set exactly to your fitting specifications. This will require a 50% deposit and the balance when the clubs are delivered or shipped to you. Fill out my online fitting form, answer questions by email and phone to clarify the answers on the form, and I will recommend a set for you based on the information you provide. I have had great success with this technique but it is dependent on the accuracy of the information you provide. Once we determine what you need I will send you an email invoice which you can pay with your credit card or with PayPal. When the invoice is paid I will order your components and begin building and ship the clubs to you when completed. Call me or email with the specifications you want and I will send you a price, or an email invoice you can pay with your credit card or with PayPal. When the invoice is paid I will order your components and begin building and ship the clubs to you when completed. If you prefer to pick a set in my shop that is assembled to average specifications for length, weight, Swing Weight, Loft & Lie like the sets in golf shops and golf stores you can. Please note: I have access to virtually any shaft, and any grip in the market except for some of the proprietary name brand shafts and grips. If you do not see the shaft or grip on the website, you may still be able to get a set with that shaft and grip. I do not list all possibilities on the website, only the most popular. Please feel free to contact me at customfitgolf.com.au and inquire about any clubs, shafts or grips you desire. All clubs made by me are custom built after you order. Clubs will require that I order the components necessary to build them and it usually takes about 3 weeks to receive the components and build the clubs before I can ship them. Please allow at least 3 weeks from the date of your payment before you inquire about your clubs. I use the most advanced building techniques to blue print each individual club in your set and match them to one another so they are the best possible instrument you can use to hit golf shots. In some cases each club can take up to an hour to build correctly. The attention to detail and precision in matching the set perfectly insures you more consistent quality shots each time you play. How many 9 or 18 hole rounds do you play per month? How many times do you practice on the range per month? Are you presently taking lessons and working on your swing? Are you seeing improvement/permanent change in your swing? Which best describes your stance and posture in the address position? Do you have any physical handicaps or impairments which adversely affect how you swing or play? When you hit the ball off centre, what is your predominant off-centre horizontal impact tendency? How high do you normally tee the ball with the driver? What is your average CARRY distance (in metres) with your current driver when you make a solid contact? What is the brand, model name and loft of the driver you are currently using? What is your average CARRY distance (in metres) with your favourite fairway wood when you make solid contact? What is the longest fairway wood you hit with confidence? 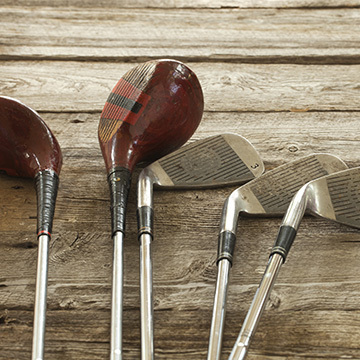 What is the brand, model name, head number and loft of each of the fairway woods you are currently using? Do you hit the ground first ("fat shot") as a frequent problem with your irons? What is your average CARRY distance (in metres) with your irons for each of the numbered irons listed below when you make solid contact? Sort the desired game improvement goals by priority among the goals listed. Simply drag & drop the options with your most desired goal at the top. We know that the shape, style and appearance of the clubheads in your custom fit set must be pleasing to your tastes in head design. Please give your opinion on the following shape and style features.